Years of rumors have finally be made official. 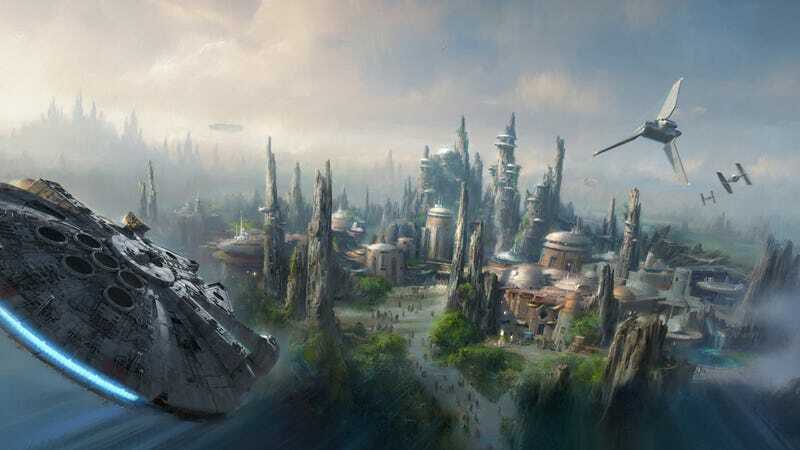 Disney CEO Bob Iger just announced at the D23 Expo that they are making not one, but two, full-on Star Wars-themed lands at their theme parks. One at Hollywood Studios in Orlando and one at Disneyland in Anaheim, marking their largest single land park expansions ever. At 14 acres wide, the parks will transport fans to a whole new Star Wars planet (which, from the images, looks a lot like Naboo) that’s located on the edge of the Outer Rim. Every inch of it will be from the series’ mythos. Everything will tie in. There will be cantinas operated by aliens, and all that good stuff. As for the rides, there will be two major ones. One will let fans fly the Millennium Falcon on a secret mission, the other will place them in between a fight with the First Order and the Resistance. UPDATE: Disney offered no details on when these two Star Wars lands would be done, except to say it would take time. While we wait though, they announced a few new Star Wars updates for the parks in the coming months. First, the legendary ride Star Tours: The Adventures Continue will be getting a Force Awakens update in the coming months. They’ll add a new location from the film into the experience of the ride, as well as some new characters. Second, there will be an update to the Jedi Academy where kids can learn to be Jedi. Third, they will launch an attraction called Star Wars Launch Bay, which is a huge space fans can walk through to see props, costumes, drawings and more from the Star Wars universe. Finally, in early 2016, sort of like the popular Star Wars Weekends events at Disney Orlando, they’re launching a limited time seasonal event called Star Wars: Season of the Force. The park will have a ton of exclusive, limited time events, foods, characters and more. One example they gave was Space Mountain would be transformed into Hyperspace Mountain. The traditional ride will be updated with Star Wars music, visual effects and more. This will be in both Orlando and Anaheim. Here’s the official announcement on the lands. Today at the D23 EXPO 2015, The Walt Disney Company Chairman and CEO Bob Iger announced to an audience of more than 7,500 fans that Star Wars-themed lands will be coming to Disneyland park in Anaheim, California and Disney’s Hollywood Studios at Walt Disney World Resort in Orlando, Florida, allowing Star Wars fans to step into the stories from a galaxy far, far away.